The fastest and most cost-effective way to replace brochures with a powerful multimedia pod. Save Money and Reduce Wastage - don't print, transport, store and throw away hand-outs. Save Time and be More Responsive - InfoAktiv automatically emails customers with the information they ask for. Generate Quality Leads - instead of just contacts. InfoAktiv uses your existing materials (standard PDFs, PowerPoints, videos, web sites, Flash files, product demos etc.) 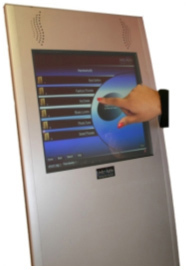 to build a powerful touch screen system that is optimized for your events. Remove any restrictions on the quantity of material you can take to an event - have everything a prospect might want ! Your customers and prospects can take what they want by email, USB stick or print-on-demand. Bring ordinary brochures to life and use more effective media such as video and interactive presentations. Eliminate the overhead of following up information requests. Have qualified leads instead of just contacts - saving time and money in post-event qualification. Avoid missing opportunities - you know exactly who took what so you can take control of the sales process earlier.